PAUL BISHOP’S ‘CROAKER: TEQUILA MOCKINGBIRD’ AVAILABLE WITH NEW CONTENT! Paul Bishop is one of Los Angeles's most respected cops. For over thirty five years, he has played hardball on the streets for one of the toughest police departments in America. As a result, he brings the kind of authenticity to his Fey Croaker novels only an insider could achieve. Pro Se Productions proudly announces the release of CROAKER: TEQUILA MOCKINGBIRD, also featuring a never before published story based on Bishop’s police career. The murder of a highly decorated detective assigned to the LAPD's clandestine Anti-Terrorist Division appears to be an open-and-shut case of domestic violence turned deadly. However, nothing is what it seems – as Fey Croaker discovers after the chief of police removes responsibility for the investigation from the department's elite Robbery-Homicide Division and assigns it to her. But the price of truth is high – maybe even higher than Fey can pay. Struggling to overcome her personal demons, especially the death of her lover, Fey and her appealing crew—the dynamic Arch Hammersmith and Rhonda Lawless (a.k.a. Hammer and Nails), Brindle Jones, Abraham Benjamin Cohen (a.k.a. Alphabet), and Fey's second-in-command Monk Lawson—are turned into human targets as they race to stop a south-of-the-border terrorist from striking at the very heart of Los Angeles. 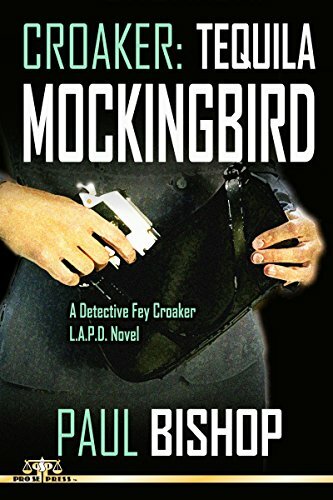 Riveting in its plausibility, Tequila Mockingbird confirms Paul Bishop's place among the best of the police thriller writers with Fey Croaker and her team at the top of their form. With a stunning cover by Keith Birdsong and print formatting by Antonino Lo Iacono and Marzia Marina, CROAKER: TEQUILA MOCKINGBIRD is available for $15.00 in print at https://www.amazon.com/Croaker-Tequila-Mockingbird-Paul-Bishop/dp/1548509272/ref=sr_1_3?ie=UTF8&qid=1499790157&sr=8-3&keywords=tequila+mockingbird+bishop and in Pro Se’s own store at www.prose-press.com. This updated third Croaker novel is also available as an Ebook, designed and formatted by Lo Iacono and Marina for only $2.99 at https://www.amazon.com/Croaker-Tequila-Mockingbird-Paul-Bishop-ebook/dp/B073RR469G/ref=sr_1_1?ie=UTF8&qid=1499790157&sr=8-1&keywords=tequila+mockingbird+bishop and is available for free for Kindle Unlimited members. THE GUNSMITH #414: DEATH OF A GANDY DANCER NOW AVAILABLE!